Employing advanced noise-reduction techniques like Bevelled Blade-Tips and Vortex-Control Notches, the NF-B9's highly-optimized blade design provides superior pressure and airflow performance at extremely low noise levels. 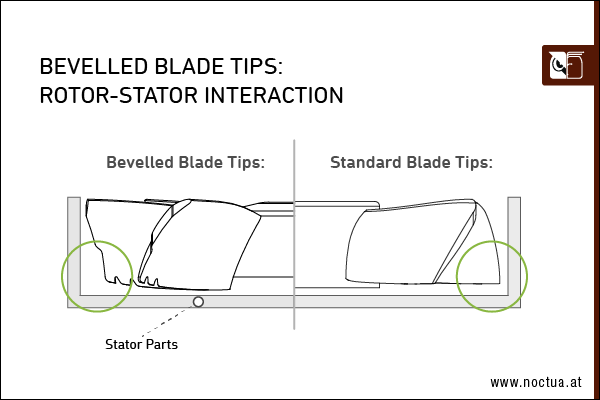 By increasing the distance between the impeller and the frame at the outermost areas of the fan where the impeller achieves the highest velocities, bevelled blade tips help to reduce critical rotor-stator interaction. This measure makes it possible to combine the large blade surface area and high profile chord length of a high-output blade geometry with excellent quietness of operation. Basically, an increase in static pressure usually brings about higher noise emissions. In the case of the NF-B9, this problem is dealt with by adding Vortex-Control Notches to the blades' trailing edges. 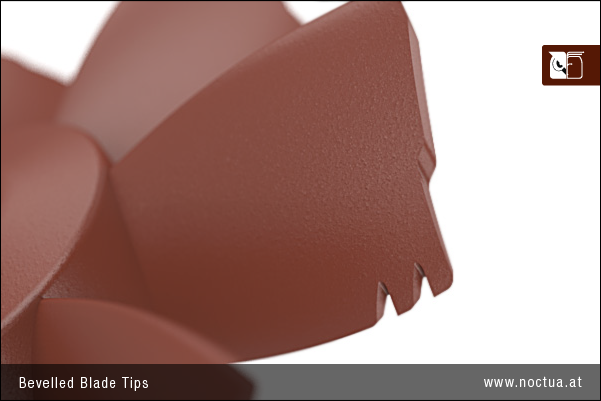 Due to the two notches at the trailing edge, the flows along the suction and pressure side mix more smoothly. This allows for less turbulence and velocity loss, which leads to a significant reduction in noise emission as well as increased efficiency. In order to achieve the smoothest possible transition and maximum noise reduction, the Vortex-Control Notches are rounded in shape. 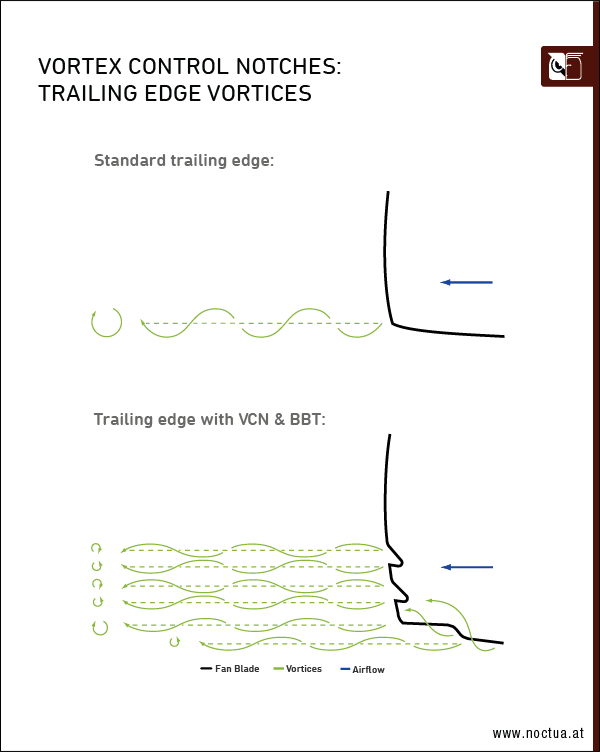 In addition to optimizing the joining of the flows at the trailing edge, the Vortex-Control Notches fulfil the task of psychoacoustic optimization: Due to the Vortex-Control Notches, trailing edge vortices are split up into several smaller vortices. Thus the noise is spread over a wider range of frequencies and therefore perceived as much less annoying.